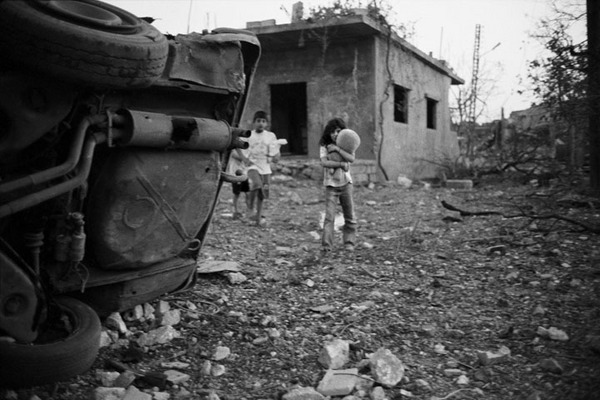 Children walk through their war-torn village of Siddi Qine, in southern Lebanon, August 15, 2006. Unexploded ordnance litters much of the southern villages. Estimates range from tens to hundreds of thousands of unexploded cluster bombs. The BBC reports that the UN warns it may take two years to clear them. Out of the 18 killed and more than 80 injured in explosions since the end of the war a quarter were children. Farah Nosh, "Lebanon," in POYi Archive, Item #46180, http://archive.poy.org/items/show/46180 (accessed April 18, 2019).